Remove the mold and clean up the interior of the corpus. In my case, since the mold is collapsible and comes apart in several pieces, it is pretty convenient to get the mold out. I use a small electric screwdriver to remove eight drywall screws, and back off twelve more, and the thing just comes right out…no fuss. The twelve that were just backed out are the ones securing the corner blocks and neck and end blocks in the mold. So, here is the corpus, fresh off the mold, with all the blocks still square and rough, and the linings only roughly trimmed, not scraped. 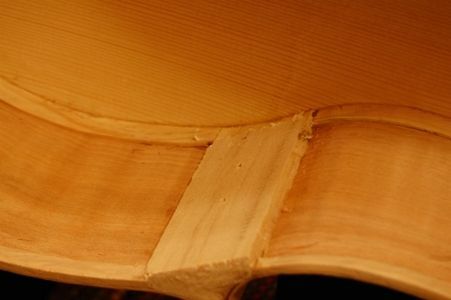 Cello interior immediately after removing the mold. All the blocks are still rough and square. Linings still need final scraping. This is the end block. You can see the rounded part that I shaped before installing the front plate, so that I would not risk damaging the front plate while shaping it. The rest of the block was out of reach in the mold. Now it is time to shape all the blocks. Here’s what the corner blocks and linings looked like. The linings had been trimmed with a knife, but not scraped. I tend to make my neck and end blocks a little oversize. I have seen blocks split and break, because they were too small…it seems an easy way to insure against that sort of thing. All the blocks are now the size and shape I want them, and scraped smooth. So, the next step is to get the back plate in place. I aligned it carefully, checking all the margins to see that the overhang was fairly even all around, then clamped it in place, dry, using spool clamps. 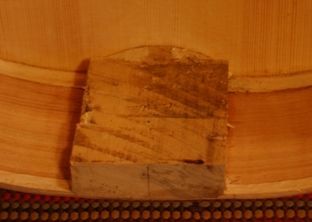 After I was satisfied that the overhangs were correct AND the elevation of the fingerboard was correct (an easy thing to mess up, as the corpus is quite floppy at this point), then I clamped everything solidly, and began removing a few clamps at a time, and inserting hot hide glue, using a palette knife. I washed off the excess glue with hot water, and re-tightened all the clamps. 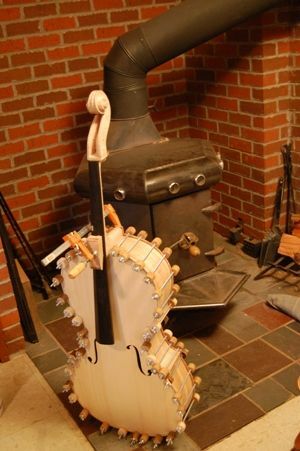 Here the cello is in all its spool clamps, with one bar clamp to secure the button to the heel of the neck. 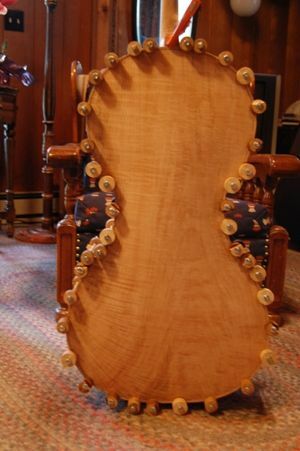 The cello back is fully installed, with hot hide glue and spool clamps. 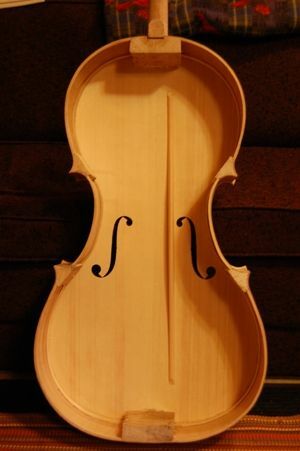 The bar clamp secures the back button to the neck heel. 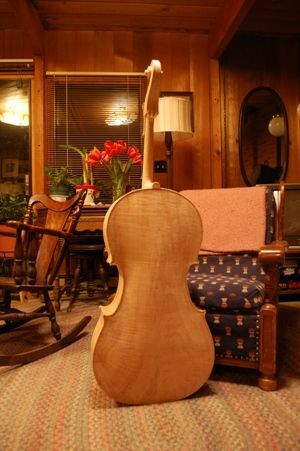 The house was pretty cold this morning, so I decided that the cello would dry faster in a warm room. Close to the woodstove (but not too close) is the best place I could find. 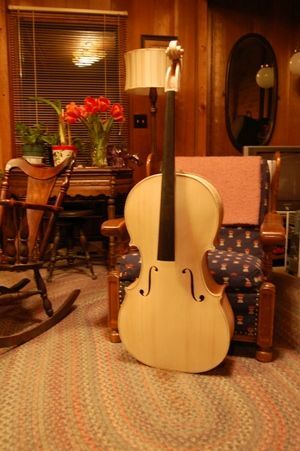 Cello in the white, from the front. A little more edge-work to do, tomorrow morning, and I can begin the finish work. And there is that one-piece back…it has come a long way since that big slab we started with, hasn’t it? I still have some final smoothing of edges, etc. to do, then it is time for varnish. For those wondering about the pegs, saddle, nut, etc. 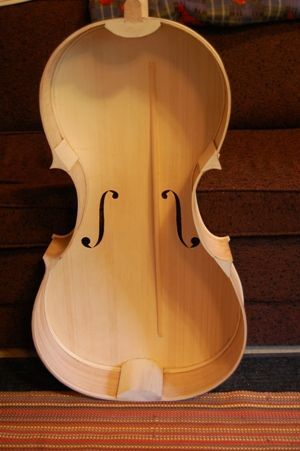 ; I wait until the varnish is complete before adding those fittings.